Last week my husband and I had the chance to sneak in a lunch date, while the kids were at school, and we decided to dress up “just because”. So, instead of wearing my usual skinny jeans + heels combination, I opted for a cozy but sophisticated look. Both of these pieces are insanely comfortable – I literally could sleep in this sweatshirt…it’s so soft! And the combination of the two resulted in a modern look that I absolutely love – did I mention both these pieces are under $30 each?! 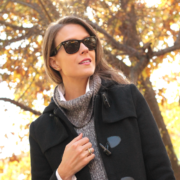 Nothing beats getting away with wearing clothes that are comfy (& affordable) but look chic!